This camp is designed for players to develop their speed, agility, coordination, and strength while working on their individual technical skills. 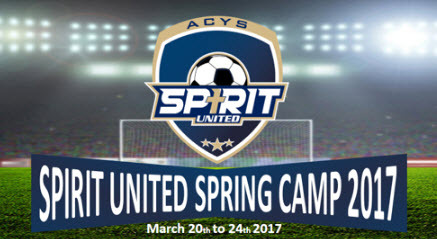 The ACYS Spirit United Spring Break Camp is tailored to meet each individual’s personal goals to ensure development and success. Check In and Out with the Site Admin every morning and afternoon. Foosball Table, Air Hockey, Movies/Video Highlights, etc. All Equipment, Water, Sports Drink, one additional snack per camper per day, one Spirit United Camp Shirt to be worn each day at camp. In the event of lightning, all campers will go indoors. In the event of severe weather beyond our control, parents will be notified by cell phone if campers require an early pickup. Please Note: ACYS Spirit United and Trotters Park have no control over climate conditions. We will do our best to accommodate campers during inclement weather and therefore camper fees are as is, no refunds will be issued. Any medical issues need to be brought to the attention of the camp staff, prior to the start of camp, i.e. allergies, medication alert, etc. and noted on the medical release form. Check-in begins on site at 8:30 am. Camp begins at 9:00 am. Please plan to arrive by 8:30 am. BRING WATER BOTTLE AND BALL TO CAMP EVERY DAY AND WEAR YOUR SHIRT!! WE WILL HAVE SHARPIES FOR NAMES TO BE WRITTEN ON THESE ITEMS. ***Please Click Here to Download the Waiver Liability and Medical Release Documents. These MUST be signed and returned to the Camp Staff on the first day of camp.